Participants in a Middle East Peace Initiative fact-finding tour today visited Haifa to see the results of rocket attacks on that city at first hand. 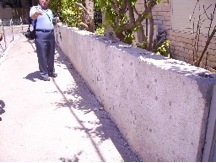 The Deputy Mayor of Haifa, Mr. Shmuel Gelbhart, showed a short film of the conflict before they went out to visit individual places that had been hit by Katyusha rockets as evidenced by a tell-tale spray of ball-bearings embedded in the surrounding areas. Each warhead had been full of tens of thousands of such ball-bearings that were shot out of the rockets on their explosion. 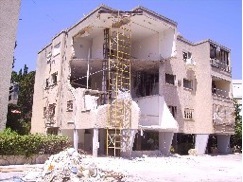 Whenever sirens had warned of an imminent rocket attack on Haifa, people were advised not to go outside even to go to bomb shelters but instead to go to an inside room or corridor. In the conflict twelve people were killed and there were approximately four hundred and fifty civilian casualties. casualties were taken and which had itself been hit by the blast of one rocket during the war. 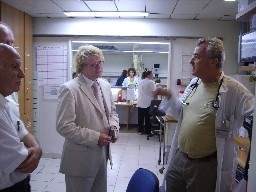 A surgeon at the hospital, Dr. Michael Kafka, said that there were still many patients recovering in the hospital.